Welcome to Part 2 of our online study, In God’s Presence. During Part 1 we discovered that in the presence of God is God Himself and He promises to never leave us. With Him, there is strength, security, purpose, and community to be found. We also learned there is peace, courage, comfort, renewal, and grace awaiting us in God’s presence. Could there be even more? The answer is, yes. Today we are joined by Tricia Underwood. Tricia shares about the compassionate healing found in God’s presence. We pray you are blessed. Many times in Scripture, we read words that say Jesus was moved with compassion prior to healing. Perhaps the most compelling, compassionate healing that took place was one in which the word “compassion” was never mentioned, however. In Mark 5:31-43, there is a father (Jairus) who asks Jesus to go to his house to lay hands on and heal his little girl who is dying. Jesus then asks, “Who touched my robe?” When the woman admitted what she had done, Jesus next said, “Daughter, your faith has made you well. Go in peace. Your suffering is over.” (Mark 5:34) No other place in Scripture has Jesus used the word, “daughter”. 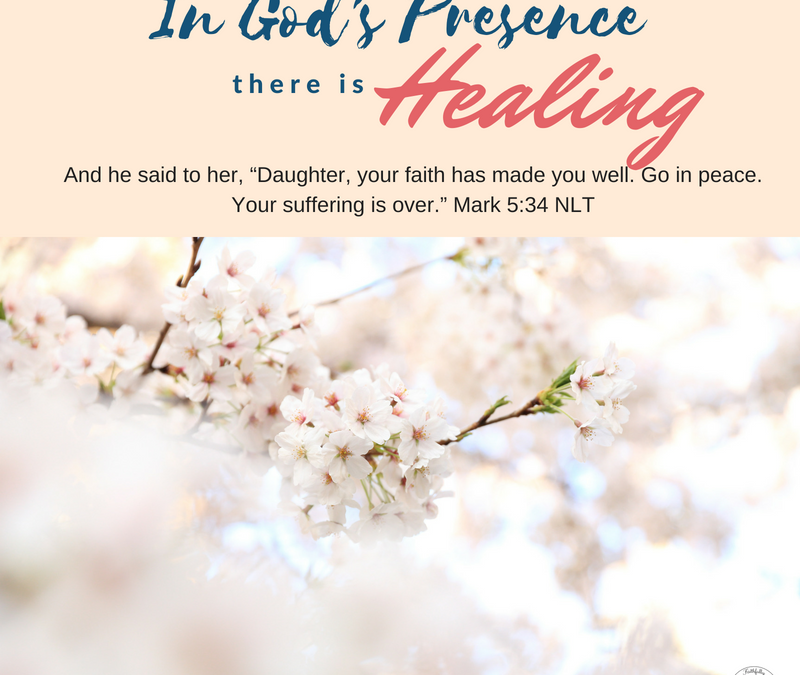 Referring to her as “daughter” illustrates the compassionate healing she received in her body and her soul that day, by being close enough in His presence! Why would this mean so much to this woman? Why would SHE need to HEAR that someone thinks of her as His daughter? We aren’t afforded the glimpse into her family life, but we do know that culturally, because of her condition of bleeding for twelve years, she was considered an outcast and as an untouchable in society. Perhaps this was true even in her own family. She needed to hear that she was accepted as “daughter”. That she was worthy of healing. 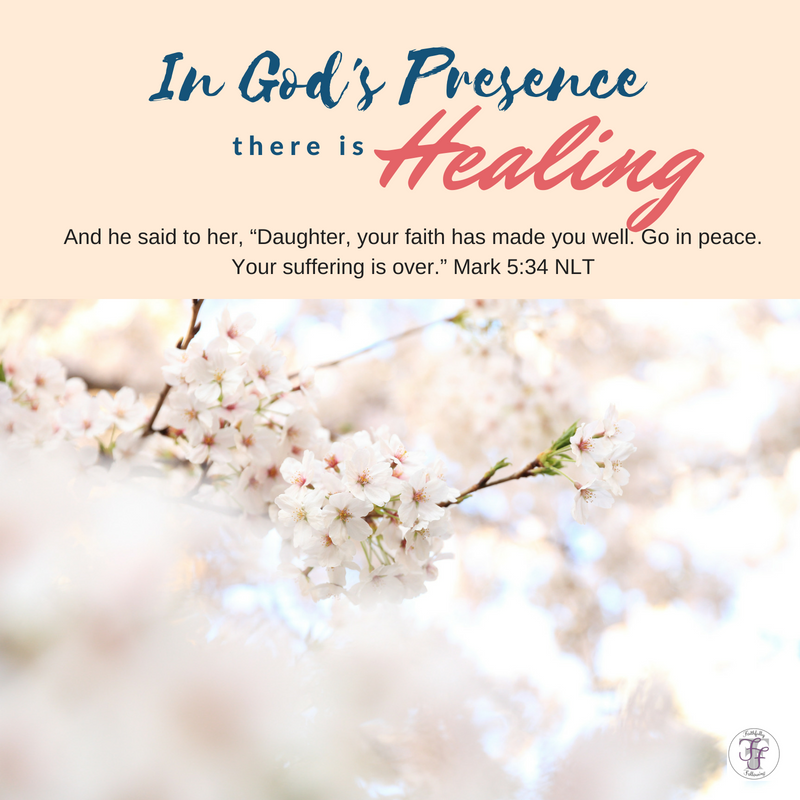 God’s plan concerning our healing is compassionate, daughters! While Jesus was still speaking to the woman, Jairus got word that his daughter had already died. How many of us, as Jesus’ daughters, are wondering if the miracle we’ve been praying for has already died, asking ourselves as the messengers to Jairus did, “Why even bother Jesus with my miracle?” What did Jesus tell Jairus? Jesus told Jairus in verse 36 not to be afraid and to, “Just have faith.” Jesus went on to the house of Jairus and woke up that which appeared to be dead! In the presence of God, there is compassionate healing! You are worthy. You are a daughter of the King! Have faith. He still wakes up that which appears to be dead! Lord, You are enough. Just a touch of your hand, a whisper of your voice to your daughter’s heart changes things. Your love provides perfect healing. Thank you for caring about our every need. Thank you for your compassion. Thank you for the promise of eternity free of disease, suffering, and pain. We trust that you are still in the miracle business but sometimes the sickness of this world overwhelms us. Help us have faith that is greater than our fear. Amen. Waiting for twelve years had to be difficult. Over the last two weeks, we have discussed many things found in God’s presence; strength, peace, courage, comfort, to name a few. How can knowing more about God help us in times of waiting? Does remembering that God’s timing is different from our own help you with trust and patience? How can we wait with trust and patience? Think back over our study thus far, flip through your notes. Locate a verse that you can cling to in the wait. Write it on a card where you can see it often. God cares about our complete healing. Physical, mental, spiritual. He sent His one and only son for our complete healing. At first glance it may appear that Jesus is discussing physical healing, but what type of healing is Jesus teaching about? God offers us each eternal life, free from pain and suffering when we believe Jesus is His only son sent to die on the cross for our sins (John 3:16). What is the Lord’s reason for being patient towards us? Does this help you with patience towards others? A beautiful reminder of the compassion of God for us. There is nothing better than being in His presence. Beautiful reminder, specially in this physical trial I am walking through. My physical body may be broken but my spirit has been healed as I keep my eyes on the prize, eternity with Jesus! We are praying for you Nancy.